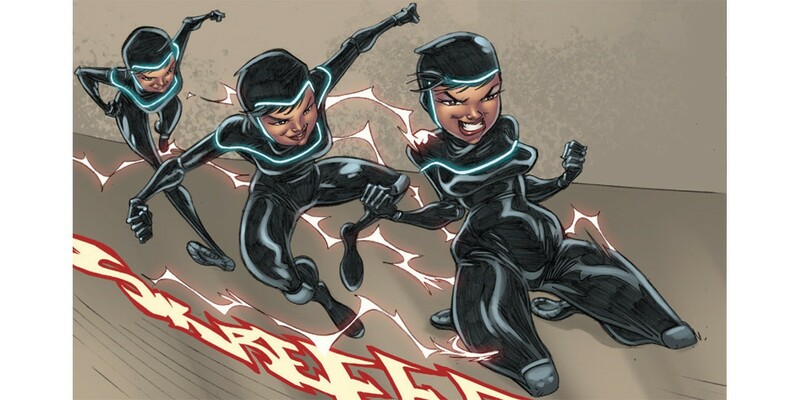 Joey Caswell of Read Comic Books likes how THE BOUNCE blends classic superheroics with something new: "Every issue of The Bounce has been absolutely wonderful thus far, and the latest installment is no exception. This series has a very familiar overall feeling to it, but some of the ideas and their execution feel incredibly unique and new." Jen Aprahamian of ComicVine is impressed by Tony Harris's work in CHIN MUSIC: "Within those artfully-designed panels is a lush and beautiful world, populated with characters that feel deep and weathered and storied. It's heavily stylized, in the best way possible -- I'm struggling to find better modern examples of deco style, especially in the comics medium. Every tiny detail, from Shaw's heavy eyelids to the way Ness dangles a cigarette, begs to be seen, yet doesn't fight with the flow of the page." Russell Johnson of Unleash the Fanboy loved the time he spent with I LOVE TROUBLE from start to finish: "I Love Trouble was an all too short series that packed it’s fair share of punch. This was a title that stood out for it’s look and it’s style all while telling a fun, action packed story with a tremendous female lead. Felicia deserves to go out on a high note and Symons makes sure she does. That said I would “love” to see Symons have the opportunity to bring her back in some fashion because the comics industry is better off because of the characters and the creators of I Love Trouble. Felicia, I miss you already!" Dustin Cabeal of Comic Bastards is so into REVIVAL that each issue feels like an event unto itself: "Here’s how much I enjoy this series; I started to read it and put it back down… twice. Not because I thought it was going to be a bad issue, but because I was too excited to read it. It gives me chills when I start a new issue and that’s incredible. There are few other series that can do that, but Revival manages it every month." Greg McElhatton of Comic Book Resources digs THIEF OF THIEVES #16 in a big way: "'Thief of Thieves' #16 is another strong installment of a fun series. There are lots of little bits peppered throughout -- double-crosses, the increasingly dire situation that Augustus is in, and the big question on how Conrad's ex-wife is involved in it all -- and it sets everything up perfectly for the next chapter. "Thief of Thieves" continues to provide fun from start to finish."